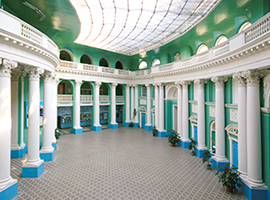 In 1921 by the initiative of professor K.N.Kornilov at the 2nd Moscow State University, organized on the basis of the Moscow High Courses for Women, the pedagogical faculty was open for teachers training with university education. Its structure included six offices, including the preschool. K.N.Kornilov attracted to work the creatively conceiving teachers, the scientists, the best organizers of national education: M.M. Vilenskaya, A.V.Surovtsev, E.V.Yanovsky, R. M. Bass, N.A.Metlova; E.A.Flerina (since 1924). The first teachers of preschool office were at the beginnings of development of the Soviet pre-school pedagogy and the preschool activity organization in the country. Today the faculty is still the advanced educational institution in the field of preschool pedagogy and age psychology where leading teachers of the country are brought together. At first the office prepared tutors and managers of kindergartens, inspectors and methodologists for departments of national education. Then the office began to prepare teachers of pedagogics and psychology in preschool normal school; methodologists on preschool education. The first manuals were written: «The fine arts at preschool age» E.A.Flerina, «Preschool education» by F.S.Levin-Shchirina and D.V. Mendzheritskaya, «Musical education» by N.A.Metlova. The outstanding role of teachers of department of pre-school pedagogy during this period is that some of them become the heads of separate branches and structures of preschool business. L.I.Krasnogorskaya becomes the first editor on preschool business; A.V.Surovtsev – the editor-in-chief of the magazine «Preschool education». In the 30th years E.A.Flerina, L.I.Krasnogorsky were authors of a popular book for the aid to education of the child in a family, etc. In 1959 the preschool office receives the status of independent faculty. The big contribution to faculty development of this period was brought by M.M. Konin and V.I.Yadeshko. The teachers activity of the department of preschool pedagogy and psychology considerably increases with the organization in the 1960th years of scientifically methodical council for preschool education at the Ministry of Public Education of the USSR where the head was the doctor of psychological sciences, academician A.V.Zaporozhets, and the deputy assistant professor V.I.Yadeshko. Since 1960th the contingent of foreign students steadily grows. During this period there is a further improvement of specializations in techniques, the faculty turns into the center for training for establishments of preschool education not only of our country, but also of many foreign states. The traditions put by the senior generations were continued by teachers: pre-school pedagogy – V.Y.Voronova, E.I.Korzakova, I.M.Kononova, E.K.Suslov; methodology of the native language – M.M.Alekseev and V.I.Yashin; methodology of physical training – E.Y.Stepanenkova; methodology of graphic activity – V.B. Kosminskaya, N. B. Halezova, R.G. Kazakova; natural study methodology – V. G. Fokina; managements of preschool education – V.V.Danilov, L.V.Pozdnyak, A.K.Bondarenko, L.M.Volobuyeva, N.N.Lyashchenko, A.O.Ryvkina, etc. In close cooperation with teachers of special departments professors worked at faculty in different years: A.A.Wenger, L.D.Getmanova, A.E.Dmitriev, O. M. Dyachenko, V.D. Ilyichev, T.S.Komarova, Z.V.Lyubimova, V. S. Mukhin, T.A.Repin, V.A.Rotenberg assistant professors: K.I.Veresotsky, V. V. Golubev, L.V.Zankovskaya, L.S. Kiselyova S.F. Kozlov, L.T.Lisitsina, G.P. Sosnovskaya, T.N.Schastnaya, A.P.Chabovskaya, I.S.Chetverukhina and many others. For years of existence the faculty prepared over 20 thousand experts: teachers of pre-school pedagogy, psychology, private methods, for teacher training colleges and higher education institutions, heads of preschool institutions, methodologists, teachers and psychologists, musical heads, etc. Annually more than 150 graduates join pedagogical staff of preschool institutions and colleges. In preschool institutions of Moscow the programs created by teachers of faculty are realized: «Adaptive training of mathematics» (T.I.Erofeeva), «Education of moral senses and the relations of children» (R.S.Bure), «Musical development of the child» (O. P. Radynova), «Children’s endowments» (R. G. Kazakova), «Ecological education» (V.G.Fokina, O.M.Gazina), «Specific features of socialization of children and social and psychological adaptation» (T.D.Martsinkovsky), «Development of mental creative abilities of children by means of TRIZ and RTV» (L.A.Grigorovich). 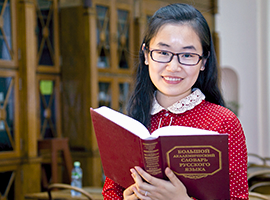 The faculty is the center of rendering of the scientific and methodical help to higher education institutions and colleges of Russia. 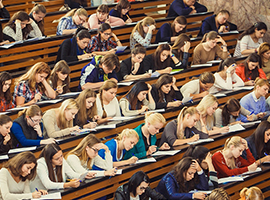 On the basis of faculty there is educational and methodical council on pedagogics, psychology and techniques of preschool education. It unites representatives of various regions of Russia and the CIS and carries out the development of strategy of training, organize an exchange of experience of educational and methodical and scientific work in higher education institutions, examines manuals, educational and professional programs of the higher pedagogical education, renders the advisory help to deans and managers of departments, to teachers, holds seminars, scientific conferences, creates training programs and grants for students. Scientific subject 1: «Scientific and methodical foundations, contents and technologies of preschool and preschool education in the conditions of pre-school educational instituion and a family». Project head: Yerofeev T.I., professor, acting as head of the department. 21 scientific works were published in 2010-2011. Scientific subject 2: «Formation of actual professional competences of teachers of preschool education in the conditions of multilevel model of education». Project head: Volobuyeva L.M., professor. 32 works were published in 2010-2011. Subject: «A historical and genetic approach to a socialization problem at different stages of ontogenesis». Project head: Martsinkovsky T.D., associate professor of psychological sciences. It 32 works were published in 2010-2011. Head: candidate of pedagogical sciences, professor, Valentina Yashina. At the department the schools of sciences continue to develop. The teachers conduct scientific and methodical work on the most actual problems of preschool education and vocational training of experts to work with children of preschool age. Leading experts in the areas are pupils and followers of scientific and pedagogical schools of E.A.Flerina and M.M.Koninoy, E.A.Arkina and N.A.Metlova, A.V.Keneman, E.I.Zalkind who has developed as scientists earlier at the faculty. Professors V. I.Yashin, M. M. Alekseev, E.Ya.Stepanenkova, V. G. Fokina are the authors of scientific publications, manuals, direct graduate students. Scientific subject – «Culturological aspect of problems of preschool education». The project head – Radynova O.P., doctor of pedagogical sciences, the professor, head of the department of esthetic education of children of preschool age. The total amount of publications for the last year is 39.